It was great having had a sense of peace and quiet and some stability for a bit. But it didn't last long. It started going into chaos again last week Monday. I didn't write about the business idea anymore, because it was so up-and-down, that I was hoping to bring it out as a 'package', something that we had 'started with'. But somehow we never seemed to get to that point. After the friends from Quito hooked off, we found people who actually seemed even more promising. The whole idea was to get Alpaca wool (Andes=Alpaca's, right? ), let someone card it, spin it and weave it into a very thin-fibre cloth of 100% baby Alapaca wool. From this cloth we would make some babyclothes; a line of wrap-around bodysuits, a line of different kinds of hats, a line of pants-with feet and blankets. All from either 100% baby Alpaca wool or this, mixed with silk. All organic. And more then organic; environment, sustainable and human and animal friendly. For the silk this would mean; not get the silk by boiling all the caterpillars in their cocoons alive, but sacrificing 30% of the silk when they come out spontaneously and use the 70% that they leave intact. The people who seemed very promising actually had their own Alpaca farm (on a huge conservation land they had bought a long time ago) and made their own knitted clothes. The reason I thought this concept up, came from the amount of wool allergies I had seen in baby's. And because wool has these insulating and stress- reducing properties, some parents found this hard. 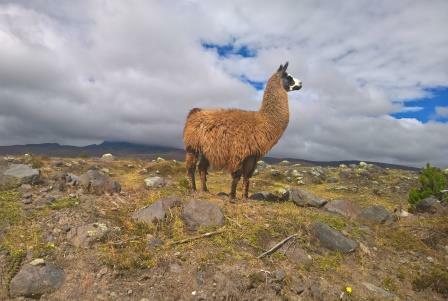 Alpaca wool is non-allergenic. It is even totally 'non- itchy'. Also; there are no woven Alpaca clothes on the market (for baby's) yet. Knitted, yes, but not woven. I imagined how nice it must feel for baby's to wear this kind of wool. 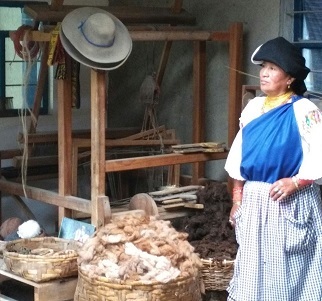 The wool from the first shearing of an Alpaca is called ' baby Alpaca wool'. It is very, very soft (and again; non itchy! I always get itchy from normal sheepwool). We thought it was a great concept. So did these people. They were enthusiastic as well. 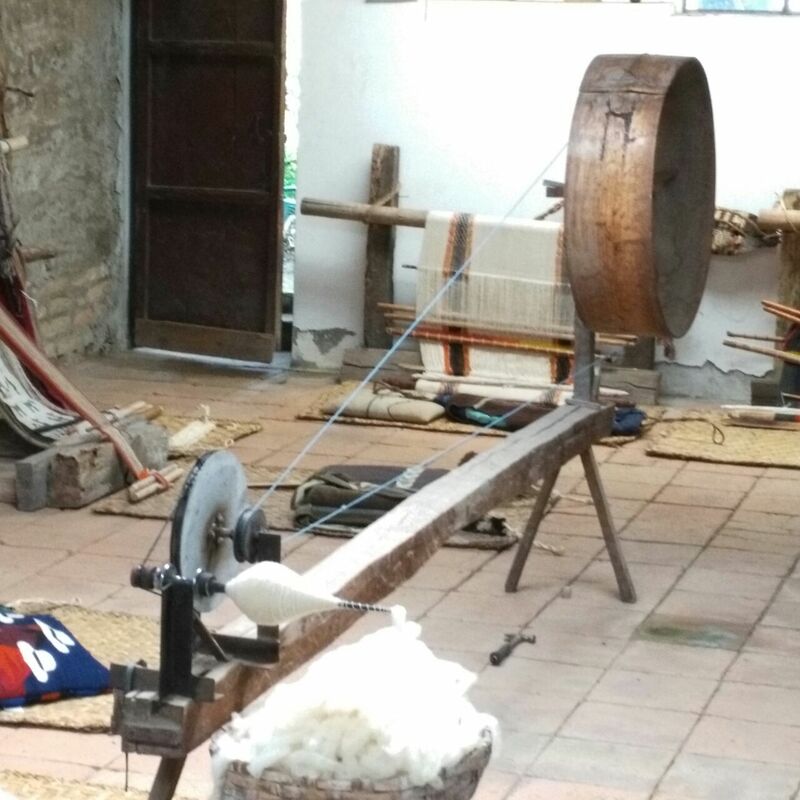 The woman managed the store, she knew how the handcrafting industry worked and was a bit worried about the amount of time it would take to get it spun and woven. Not so much because it takes so long to do, but mainly because the Ecuadorian mentality is not to have something done in time. She usually had to wait months longer then anticipated. Her husband came up with the idea to get a carding machine from the US and also order a spinning machine. These are still hand operated machines, but it would reduce the timeframe and give us some 'control' over the speed of the process (we could put the machines in a place where we would be a lot as well, to oversee everything). They arranged a meeting with a lawyer concerning 'export, tax and starting an enterprise' questions. Eric and I had already been preparing for months, so we knew almost everything there was to know about the 'Dutch end' (import, Dutch tax, etc). So after meeting the lawyer we could actually start. They said 'yes' to stepping into this business with us, during a lunch we had on Thursday the 19th of July. They would make an appointment with the lawyer (to sign the papers) for this week last week. But on Monday I got the feeling something was off. When we inquired how everything was, they let us know it was going to be too much and they had to come back on their words. They were not going to join in the business with us. On Tuesday Eric and I tried to make a plan for doing it all ourselves. We could try to learn how to weave and spin, right? And the kids could help? Or we could hire someone to teach us? I had written Nikki an email about the whole thing and she wrote back that she didn't mean to be negative, but that she had felt the whole business idea was something we already knew how to do, it was not a challenge. And next to that; two times people hook off on the last possible moment, things don't work 'with' us, etc. Why was that? Most importantly; Eric had been wanting to live out his creativity. And with this business he was not doing that. He would even be too busy to do that. Somehow this message hit us. For some time I had been doubting about this business; I felt it was a great concept, but also; did I want to spend all my time doing this? When I would voice this to Eric, he agreed. But he also thought we should work toward some income and this seemed like a good way. So we would let these doubts go again. However, this message from Nikki hit something in us -and mainly in Eric. He felt she was right. He would always find a way not to be creative. He was born into a business family. He had had a thriving business himself. Doing business came easy to him. So there was no challenge; just the normal challenges of starting it up and making it work. But also a certainty that he could do this. On the other hand; what he had been wanting to do since forever (build his own house with his own creative ideas, make sculptures with metals, etc) he would always push forward. Till when? Still recovering from this tumbling on Wednesday, we started talking about 'what now'? Because somehow the whole 'being in Ecuador' was shaking as well. We came here, based on my meditation. We have been here almost a year. We have found it very hard to find any 'foot' on the ground. If I meditate about it, it feels like I am reaching out a hand, trying to touch something around me, but there is nothing. Just empty space. Nothing comes back. It has felt like being suspended in space for this whole year. Goall-less. That is how being here has felt to us. We could not feel a connection to the land or to the people. Maybe that is not necessary. Or maybe that will come over time. Maybe having no external goal has been very good. Maybe floating in space and being completely 'loose' from everything we 'know' was good. Maybe we sorely needed this. Eric said he felt we were completely out of the matrix. The normal-ness of society. The fear based actions and logic of the world, of the Netherlands. The 'grid' of life there. Instead we were floating in no-man's land. And funny how you would love to get some 'structure' and some 'finite-ness' again. Because there is nothing comfortable about not knowing. We don't know how to live in this (new?) world with no bounds, no grid. To be 'free'. How uncomfortable. We could see the humor in this. And when thinking about what to do then? Or where to go then? We got nothing, no insights, no longings. We decided that, instead of going on wild goose-chases, we would let this rest until we really know. In the mean time Eric is going to explore his creativity and I will search for a way to do what I love; connect with people. On Thursday we drove all day to get our last things from Vilcabamba to bring back to the house in Cuenca (eventhough we don't know if we will still be here next week...or next month... or in 2 months...). We also picked up the bow the archery master and woodworker Hans had made for us. He also made arrows and protection leather, so we could practice again. It was a long, tiring day. During the drive I received a text message with a newspaper article: The verdict of the courtcase was out (link to verdict and defense). They had given me the highest 'punishment'; lifelong prohibition from working as a midwife in the Netherlands. The verdict showed no signs they had read my defense or had taken into account the whole context of everything (the health care system, the past, the situation, etc). It showed no sign of the way they had received the information during the court case. The understanding, the sympathie, the surprise at unknown factors. What happened after the court case to change their minds this way? Someone said to me 'they really wanted to get you hard'. And I think that is true. But who this 'they' is...? On this Thursday I did not feel much with the news. I felt very distant. Almost as if it was happening in another world to another person. On Friday I woke up with a sadness and a pain in my heart. I realized the thing that hurt me the most was what this injustice would cause. How it would make people even more fearful. How people would look at autonomy. How people would take even ANOTHER step away from taking responsibility for their life, for their choices. The whole day I felt darkness around me and in me, combined with an intense sadness. I knew I should not try to escape this, but just let it be. I wrote with friends about it. I let myself be squashed by it. Until I saw a shimmer of light again when I meditated about it. I also realized how good it had been for me to be so 'away' from this, this last year. How unbearable it would have been to have been in the Netherlands, with this. I contemplated going into appeal, but decided to let this rest untill I felt 'myself' again. I could see how good an appeal would be. To go into appeal with a lot of colleagues and make the 'context' visible. The background, the health care system, the fear. However; I could not do that from 'here'. And did I really want to do this? Or was this a momentary flicker of energy? He Lau! Fijn, je kleine huisje bij de zee! Heerlijk. We hebben van alles geprobeert. De uitspraak is totaal niet in lijn met hoe de tuchtzaak zelf liep. En idd was IGZ de klager. Het lijkt enorm op jouw zaak van toen. Hey Tanja, ook even in het Nederlands. Kl*tesysteem ook! Wat hebben we toch een gedrocht geschapen met z'n allen pfff. Ik voel met je mee en ik hoop echt dat er snel een keerpunt gaat komen op dat gebied (en vele andere gebieden). Hoi Marion! Gefeliciteerd! Wat leuk om te lezen! Mocht je toch besluiten niet uc te gaan (ik verwacht dat je rond de 30 weken zwangerschap wel 'weet' wat je wil/of je dat dan nog steeds wil of mss zelfs nog wel zekerder er van bent, of niet) dan ken ik iemand in je omgeving waarvan ik verwacht dat ze helemaal met je mee zal werken. Diegene werkt pas sinds 1 jaar in jullie buurt, dus je hebt misschien nog niks over haar gehoord. Laat maar weten als je meer wilt weten. Knuf aan jullie! Kijk, lange leve internet, lekker snel zo ;-). Namen mag je altijd geven Tanja, graag. Je mag me ook mailen, als je dat fijner vind. We gaan de komende tijd goed voelen wat we ermee willen, maar het is altijd fijn om 'een-achter-de-handje' te hebben die erg open-minded is en lef heeft! Ik snap het Tanja, we zijn zo geconditioneerd om altijd maar met het verleden en de toekomst bezig te zijn, dat we onze natuurlijke staat -in het nu leven- verleerd zijn... Maar petje af dat jullie al bijna een jaar zo leven, met de kinderen! PS: Nicole is inmiddels ook bevallen van een gezonde zoon!